Novomatic has added to its already bulging roster of Chinese-themed video slots with Asian Fortunes. It’s a simple 5 reel, All Ways pays title that comes with 2x multiplier wilds and a bonus round that awards up to 20 free spins with higher value symbols only. You’ll also have a chance to win 1 of 4 potential jackpot prizes. Play on your PC, tablet or mobile from between 40p and £100 per spin. There aren’t many surprises on offer in the Asian Fortunes. The design and gameplay is just what we’ve come to expect from a Novomatic-powered video slot. The action takes place on a set of deep red reels. There you’ll find lower value A to 9 symbols as well as a typical selection of objects associated with the Chinese theme. In order of value are fans, gold coins, gold pots and a green dragon. The golden dragon face is the most lucrative symbol. Land 3, 4 or 5 of these on adjoining reels and you can look forward to a payout of 1, 3 or 12 times your total bet. Boosting your winning chances are 2 different wilds. The standard red wild can hit on reels 2 and 4 only. They’re joined by the blue wild that can hit on the middle reel. When this blue wild forms part of a winner, the payout is doubled. The main feature is the Free Games feature – it’s triggered by landing 3, 4 or 5 scatters on the same spin. After pocketing an award of 0.5, 1 or 50 times your bet, you’ll then go on to play 10 free spins. The reels during the feature are amended from the base game. All of the lower value A to 9 symbols are removed and you’ll only see the 5 higher value picture symbols spinning around the reels. Re-triggers are possible too. An extra 10 free spins are added to your tally if you land 3 or more scatters. 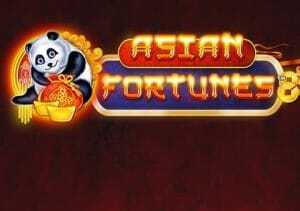 Asian Fortunes offers the chance to land a progressive jackpot prize. The Jackpot feature can trigger at random on a spin that includes a wild. Then choose from the gongs. Once you’ve got 3 matching pandas, you’ll win the associated jackpot prize. There’s nothing revolutionary on offer in Asian Fortunes. It’s a typically simple, volatile video slot from Novomatic. If you’re a fan of the Austrian developer’s games, then Asian Fortunes should offer plenty of appeal. I would recommend other Novomatic titles with Kingdom of Legend and the movie-inspired From Dusk Till Dawn.